Lipscomb baseball played the Kentucky Wildcats Wednesday night at Dugan Field in a game that came down to a tough fielding play and a rough eighth inning for the Bisons. A popup just beyond the infield in the fifth inning got lost in the lights and ended up bringing in two runs for the Wildcats. Then in the eighth inning, Kentucky was able to score four runs, all with two outs. 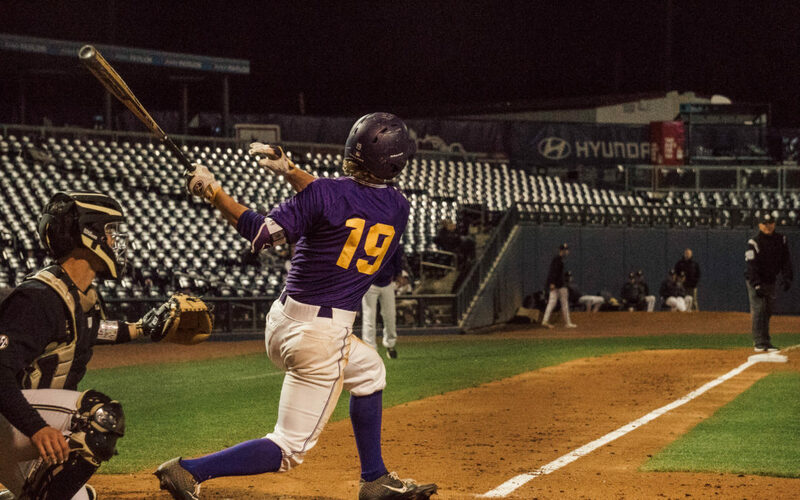 The Bisons came into the game off a tough road trip that started with ASUN conference foe Florida Gulf Coast, who swept the Bisons in a three-game series, and ended in Knoxville where the Volunteers hit seven home runs to defeat Lipscomb 11- 2. Kentucky also came into the game on a rough stretch that had seen them lose seven of their past 10 games after starting their season with a 14-8 record. Senior Erik Gutierrez made his second start of the season for the Bisons on the mound, while Kentucky put forward freshman starting pitcher Dillon Marsh. Both starting pitchers have begun the season with rough stat lines. Gutierrez came in having pitched 10 innings on the season and earning a 4.50 era, while Marsh had pitched 24 innings and earned a 6.75 era. Both pitchers might have finally gotten their season on the right track with their starts Wednesday night. Gutierrez got through the first four innings of the game not giving up any runs and only allowing two hits and one walk to the Wildcats. Marsh allowed more baserunners than Gutierrez through four innings, giving up four hits to the Bisons along with two walks but still not allowing any runs. The fifth inning was a different story for both pitchers. The Wildcats started the inning with a single to right field and got another runner on base with only one out. Gutierrez was then able to get the second out of the inning, striking out Kentucky first baseman Daniel Breydon. Gutierrez then started to escape the inning, getting Kentucky shortstop Alex Rodriguez to hit a high popup just beyond the infield; but the ball got lost in the bright lights of Dugan Field, and the Bisons weren’t able to catch the ball. The Wildcats scored two runs on the play, and Rodriguez got all the way to second base. The tough play was called a hit for the Wildcats, so both runs went in the scorebook as earned runs for Gutierrez. Gutierrez got the next Wildcat to ground out to end the inning, and he did not come back out to pitch the sixth inning. In the bottom of the fifth inning, Marsh got the first two outs, but then Lipscomb first baseman Cade Sorrells drove Marsh’s pitch over the right field wall to put the Bisons on the board and make the score 2-1. A throwing error by Kentucky third baseman Coltyn Kessler allowed the inning to continue and ultimately ended Marsh’s day. Kentucky subbed in reliever Cole Ayers to face the next Bisons’ batter Ty Jones, who grounded out to end the inning. Ayers stayed in the game to pitch the bottom of the sixth inning but seemed to lose control of his pitches when he came back out. He walked the first two Bison batters before getting the first out thanks to a sacrifice bunt that moved both runners into scoring position. Adams then came to the plate for Bisons with a chance to give the Bisons the lead with a hit; he batted a line drive to right field that seemed to be fading away from Kentucky right fielder Jaren Shelby, but Shelby made a diving play on the ball to get the second out. Jackson Furstace was able to score from third to make the score 2-2. The runner on second base tried to steal another run on the diving play but was thrown out by Shelby at the plate to end the inning. The score stayed tied at two until the top of the eighth when Kentucky started to pull away from the Bisons. Lipscomb pitcher Tyler Guilfoil came into the game with a runner already on first base with nobody out. He struck out two Wildcats to get two outs but lost control of his pitches and gave up two walks to load the bases. Guilfoil then threw a wild pickoff move to second base that went into center field and let Kentucky get the lead 3-2. Shelby then hit a rocket to left field that went over the wall and gave the Wildcats a commanding 6-2 lead. The Bisons will play Texas Southern Friday night at Dugan Field.